Extinction is a possibility for this iconic brown and orange species. Environment California, Xerces Society, lawmakers, ecologists, and citizens throughout the state are working to preserve the Western monarch. California Assemblyman Mark Stone (29th District) authored AB-2421, Wildlife Conservation Board: Monarch Butterfly and Pollinator Rescue Program, which was approved by Governor Jerry Brown on September 26, 2018. The Wildlife Conservation Board met in Sacramento on March 7 and approved guidelines for the Monarch and Pollinator Rescue Program. Grant project applications will be announced on the board’s website. Applications will be accepted year round for one of the four annual review periods. Funds may be used for restoration or enhancement of breeding habitat on private or public lands and may be used for seasonal or temporary habitats. Western monarch showed an 86% drop since the 2017 count. 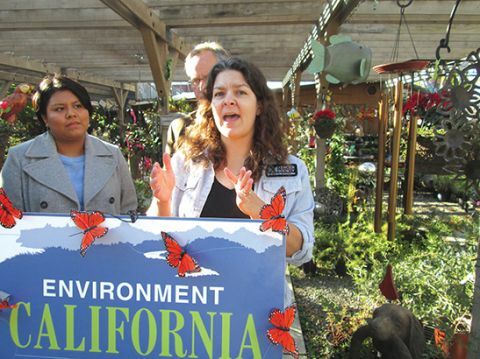 “Several factors come into play,” she said, “and one is the loss of habitat and loss of food.” She is currently working with City of Sacramento District 3 councilmember, Jeff Harris, to plant a butterfly garden at Niños Parkway in South Natomas and encourages others to do the same. Since the majority of the overwintering land is located on private property, residents and land owners may be the best hope for the species, whose numbers are down to an estimated 200,000 from its high of 10 million in the 1980s. Native milkweed is necessary for the butterfly’s survival and is being lost due to land development and herbicide use. It can, however, be planted, as Laws and Harris are doing, in gardens and other locations. The milkweed is critical since it is where the butterfly lays its eggs and the caterpillar feeds on the plant so that it can grow and become a monarch. Native nectar plants are also necessary since they provide the food for the adult monarch. Both plants need to be available in order for the monarch to thrive through its complete lifecycle and during overwintering. According to Xerces Society, “the Sacramento Valley, Sierra Nevada Foothills, and Coast Range are vital to the survival of the first generation of monarchs produced each spring,” and the group is urging the state to work to protect the butterfly by protecting its habitats from pesticide use, better manage overwintering sites and restore breeding and overwintering habitats. Other ways that individuals can help are to contribute to citizen science by making and logging observations of the monarch, stop using insecticides and herbicides which not only harm the butterfly, but these can also kill milkweed. Xerces Society and Environment California also encourage people to encourage others to do the same. According to Tierra Curry, a senior scientist at the Center for Biological Diversity, increased habitat has helped the Eastern monarch butterfly numbers to rebound, but she said that a single good year is not an indicator of future years and calls for continued protection. In June, the U.S. Fish and Wildlife Service will make a determination whether to add the monarch to the list of threatened species under the Endangered Species Act of 1973. USFWS has been reviewing data since the request was submitted in 2014. For additional information, visit https://xerces.org/.